Each year VOKRA produces and sells a calendar to raise money for the kitties. The time has now come to refresh the design and we’re looking for a volunteer designer/design firm to be our redesign partner. As a volunteer-driven non-profit, we can’t afford design costs, but our partner will be remunerated by having their name on the calendar as our design partner, free sponsorship on one of the calendar months for one year, lots of purrs from our cats in need of homes and hugs from our volunteers and cat adopters. Fundraising! Last year we raised $15,000 and we’re looking to grow this each year. 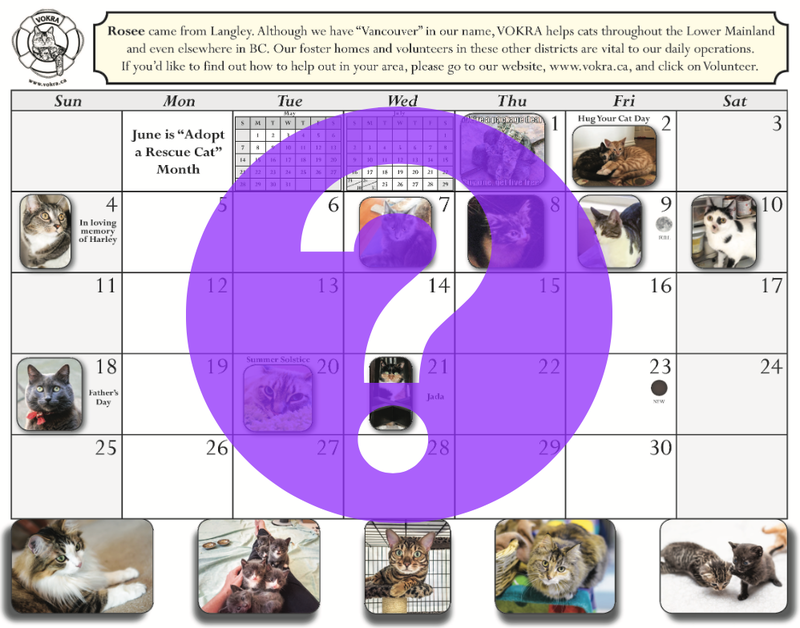 Brand messaging – To tell our story through the kitties featured each month on the calendar. Building community – Providing adopters an opportunity to see their kitties in the calendar and introducing new people to VOKRA. We’re looking for expressions of interest based on the below criteria. We’ll choose one partner who will then provide us with three design options to choose from. There are no design requirements as part of the expression of interest. Expressions of interest are due by May 1, 2017. Functionality is key. In previous years we’ve sold calendar date squares to people so they can see their adopted cats in the calendar. This has been a challenge as end users are then unable to write on the calendar because the dates squares are full. As such, the new design should leave the dates squares open. Please think outside the (litter) box. We’re open to any design format that meets the redesign criteria. This includes overall size and shape. A look and feel that fits with VOKRA’s mission statement and personality (see below). The calendar must include space for a feature cat photo each month, along with their brief story (approx. 2–3 lines) in a prominent way as part of each month’s calendar page. We’d like the story to be incorporated as part of the picture. Thought should be put into how a sponsor’s logo can be incorporated into each month. As we’d like to continue to offer adopters the opportunity to see their kitties in the calendar, we envision the ability to incorporate 5 -6 small photos into each month. This should be taken into account in the overall design. Format and design: We’re flexible and open to suggestions. Electronic submissions are preferred and can be emailed to strategy@majidkhoury.com by May 1, 2017. Learn more about VOKRA on our website at vokra.ca or visit our Facebook page. VOKRA’s mission is to end cat overpopulation and homelessness. We rescue, heal, then place cats—first in our network of foster homes, then in carefully matched, loving, forever homes. We are a passionate, volunteer-driven charity with extensive cat care experience. We believe that no-kill is the only responsible approach, that Trap Neuter Return works and that cats are AWESOME! Professional, trustworthy, compassionate, caring, knowledgeable, organized, yet loveable and playful, like a cat. « Come run with us on June 25!